I was needing something simple to work on (the day job has turned my brain to mush) so I spent a few hours last week polishing a tool that I've used in the production of Fracture the Flag. The tool allows the creation and editing of color palettes within Unity. The use of color palettes along with flat shaded low poly assets allows a significant reduction in the number of materials being used in a scene or project. This can also reduce draw calls and improve performance. Due to the flat shading models can be unwrapped and the UV's can be stacked. This allows the texture size to be very small - in theory as small as one pixel per color used in the project! This means that by using a 32 by 32 pixel texture a project can have up to 1024 colors contained in a 4 kb file! Ideal for mobile uses or simply keeping a desktop build size down to something reasonable. The editing of these textures within Unity also allows the artist or developer to quickly adjust colors of models in a scene while lighting and image effects are shown in real time. This speeds up development time as there is less back and forth between Unity and a photo editing program. All the features of Click to Color can be seen in the video below. 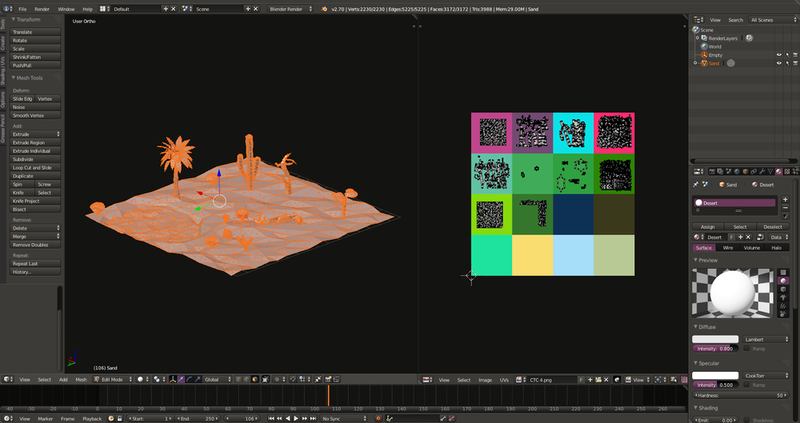 A potential work flow using Unity and Blender is shown in the second video.